A virtual private network (VPN) extends a private network across a public network, and enables users to send and receive data across shared or public networks as if their computing devices were directly connected to the private network. Applications running, on a computing device e.g. a laptop, desktop, smartphone, across a VPN may therefore benefit from the functionality, security, and management of the private network. Encryption is a common though not an inherent part of a VPN connection. VPN technology was developed to allow remote users and branch offices to access corporate applications and resources. To ensure security, the private network connection is established using an encrypted layered tunneling protocol and VPN users use authentication methods, including passwords or certificates, to gain access to the VPN. In other applications, Internet users may secure their transactions with a VPN, to circumvent geo-restrictions and censorship, or to connect to proxy servers to protect personal identity and location to stay anonymous on the Internet. However, some websites block access to known VPN technology to prevent the circumvention of their geo-restrictions, and many VPN providers have been developing strategies to get around these roadblocks. A VPN is created by establishing a virtual point-to-point connection through the use of dedicated circuits or with tunneling protocols over existing networks. A VPN available from the public Internet can provide some of the benefits of a wide area network (WAN). From a user perspective, the resources available within the private network can be accessed remotely. Early data networks allowed VPN-style connections to remote sites through dial-up modem or through leased line connections utilizing X.25, Frame Relay and Asynchronous Transfer Mode (ATM) virtual circuits, provided through networks owned and operated by telecommunication carriers. These networks are not considered true VPNs because they passively secure the data being transmitted by the creation of logical data streams. They have been replaced by VPNs based on IP and IP/Multi-protocol Label Switching (MPLS) Networks, due to significant cost-reductions and increased bandwidth provided by new technologies such as digital subscriber line (DSL) and fiber-optic networks. VPNs can be characterized as host-to-network or remote access by connecting a single computer to a network, or as site-to-site for connecting two networks. In a corporate setting, remote-access VPNs allow employees to access the company's intranet from outside the office. 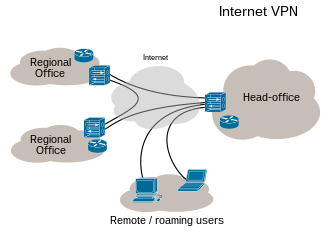 Site-to-site VPNs allow collaborators in geographically disparate offices to share the same virtual network. A VPN can also be used to interconnect two similar networks over a dissimilar intermediate network; for example, two IPv6 networks over an IPv4 network. A device at the edge of the customer's network which provides access to the PPVPN. Sometimes it is just a demarcation point between provider and customer responsibility. Other providers allow customers to configure it. As used in this context, a VPLS is a Layer 2 PPVPN, emulating the full functionality of a traditional LAN. From a user standpoint, a VPLS makes it possible to interconnect several LAN segments over a packet-switched, or optical, provider core; a core transparent to the user, making the remote LAN segments behave as one single LAN. L2TP which is a standards-based replacement, and a compromise taking the good features from each, for two proprietary VPN protocols: Cisco's Layer 2 Forwarding (L2F) (obsolete as of 2009[update]) and Microsoft's Point-to-Point Tunneling Protocol (PPTP). Users utilize mobile virtual private networks in settings where an endpoint of the VPN is not fixed to a single IP address, but instead roams across various networks such as data networks from cellular carriers or between multiple Wi-Fi access points without dropping the secure VPN session or losing application sessions. Mobile VPNs are widely used in public safety, where they give law-enforcement officers access to applications such as computer-assisted dispatch and criminal databases, and in other organizations with similar requirements such as Field service management and healthcare[need quotation to verify]. Many router manufacturers supply routers with built-in VPN clients. Some use open-source firmware such as DD-WRT, OpenWRT and Tomato, in order to support additional protocols such as OpenVPN. Setting up VPN services on a router requires a deep knowledge of network security and careful installation. Minor misconfiguration of VPN connections can leave the network vulnerable. Performance will vary depending on the Internet service provider (ISP). A limitation of traditional VPNs is that they are point-to-point connections, and do not tend to support broadcast domains. Therefore, communication, software, and networking, which are based on layer 2 and broadcast packets, such as NetBIOS used in Windows networking, may not be fully supported as on a local area network. Variants on VPN, such as Virtual Private LAN Service (VPLS), and layer 2 tunneling protocols, are designed to overcome this limitation. ^ Mason, Andrew G. (2002). Cisco Secure Virtual Private Network. Cisco Press. p. 7. ^ "Virtual Private Networking: An Overview". Microsoft Technet. September 4, 2001. ^ Cisco Systems, et al. Internet working Technologies Handbook, Third Edition. Cisco Press, 2000, p. 232. ^ International Engineering Consortium. Digital Subscriber Line 2001. Intl. Engineering Consortium, 2001, p. 40. ^ Technet Lab. "IPv6 traffic over VPN connections". Archived from the original on 15 June 2012. ^ "1. Ultimate Powerful VPN Connectivity". www.softether.org. SoftEther VPN Project. ^ "OpenConnect". Retrieved 2013-04-08. OpenConnect is a client for Cisco's AnyConnect SSL VPN [...] OpenConnect is not officially supported by, or associated in any way with, Cisco Systems. It just happens to interoperate with their equipment. ^ "Why TCP Over TCP Is A Bad Idea". sites.inka.de. Retrieved 2018-10-24. ^ "Trademark Status & Document Retrieval". tarr.uspto.gov. ^ "ssh(1) – OpenBSD manual pages". man.openbsd.org. ^ c@cb.vu, Colin Barschel. "Unix Toolbox". cb.vu. ^ "SSH_VPN – Community Help Wiki". help.ubuntu.com. ^ E. Rosen & Y. Rekhter (March 1999). "BGP/MPLS VPNs". Internet Engineering Task Force (IETF). RFC 2547. ^ Lewis, Mark (2006). Comparing, designing, and deploying VPNs (1st print. ed.). Indianapolis, Ind. : Cisco Press. pp. 5–6. ISBN 1587051796. ^ Hollenbeck, Scott; Housley, Russell. "EtherIP: Tunneling Ethernet Frames in IP Datagrams". ^ Yang, Yanyan (2006). "IPsec/VPN security policy correctness and assurance". Journal of High Speed Networks. 15: 275–289. ^ "Overview of Provider Provisioned Virtual Private Networks (PPVPN)". Secure Thoughts. Retrieved 29 August 2016. ^ RFC 1702: Generic Routing Encapsulation over IPv4 networks. October 1994. ^ IETF (1999), RFC 2661, Layer Two Tunneling Protocol "L2TP"
^ Phifer, Lisa. "Mobile VPN: Closing the Gap", SearchMobileComputing.com, July 16, 2006. ^ Willett, Andy. "Solving the Computing Challenges of Mobile Officers", www.officer.com, May, 2006. ^ Cheng, Roger. "Lost Connections", The Wall Street Journal, December 11, 2007. ^ "Encryption and Security Protocols in a VPN". Retrieved 2015-09-23. ^ "VPN". Draytek. Retrieved 19 October 2016. ^ "How can incorrectly configuring VPN clients lead to a security breach?". SearchEnterpriseWAN. Retrieved 2018-08-14.